Japan are good in making scary movies, in Youtube many scary video are uploaded that really scare out of you . some are real and some are fake. But one scary video that I watched recently in Youtube about a Ghost in Japan makes me really scared, don’t watched this if you are a scary person you might not sleep tonight? The video was about a group of friend eating and drinking in one of the restaurant in Japan. While they are playing some games, a foul odor was scattered around them, as they decided to take a cigarette to be able to not to smell the foul odor. A lady, in a vacant table was spotted by the group as they suspected that the lady is the one who is giving a foul odor. They decided to leave the restaurant, due to unlikely odor, around them, the group were divided by two, the remaining group of men went to substation, waiting for the train that they will take a ride. As they wait, they see a lady waiving on them, the same lady that they see in the restaurant. The lady moves towards them, she falls down to the train railways, when she stood up, suddenly a passing train hit her and run through her. The group of men thought she was dead, but in this video shows that the lady survive the train accident, clearly visible in the video that you can see the lady staring on one of the guy that falls down on his knee due to bad odor that he smell. This is a scary video, but some say this is authentic. 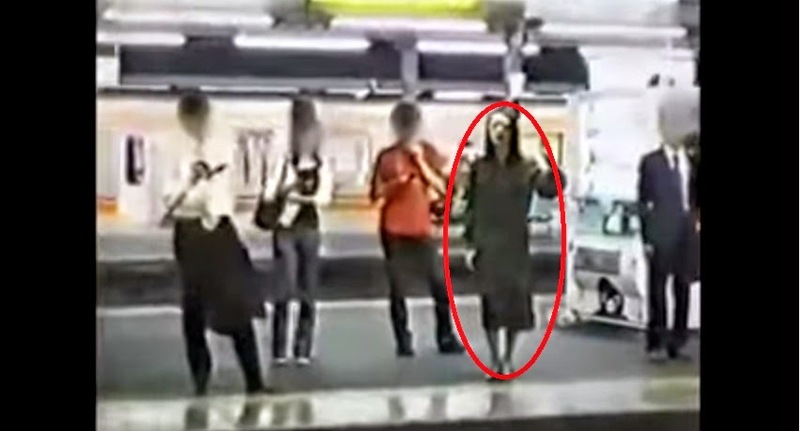 No Comment to " Watch: Scary Video Of Ghost Recorded In One Of Japan Subway Train "